As spring has turned into summer we are up against our last few chances to look at the really faint fuzzies in the spring sky. I refer of course to the mega-clusters of galaxies in Virgo and Coma Berenices. 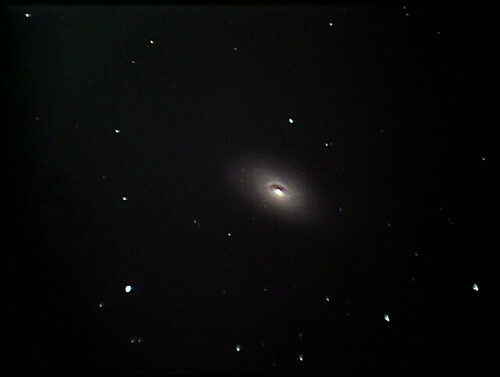 This week in Pittsburgh has been miraculously clear from summer haze, and my telescope mount has been miraculously clear from strange mechanical hiccups, which means I have spent a last few quality hours with the galaxies this week. Noticeably nicer, without a whole lot more work. From there, I then jumped into the Coma Berenices cluster and got the surprise of the night. 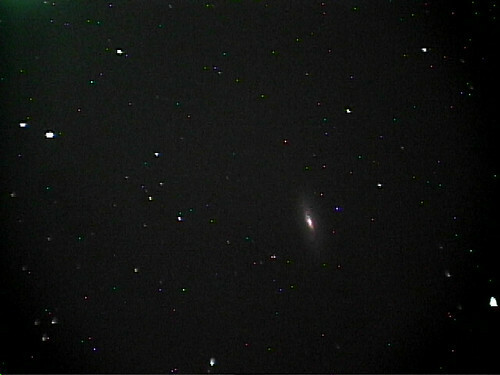 I centerd my frame on the galaxy known as (I thought) NGC 4889. But, as you can see from the picture, the object is really small. I wasn’t really sure what I was looking at. 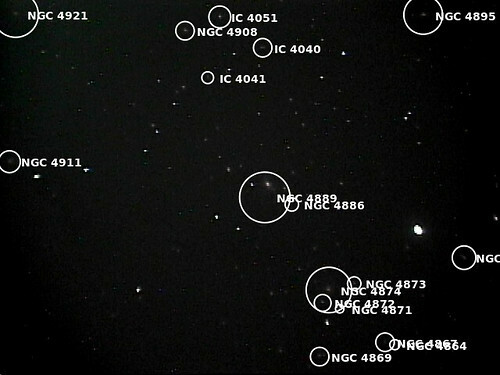 To make things more confusing, Skytools did not think that there was any object named NGC 4889. It only knew about NGC 4884. Well, it turns out that one of many bugs in the NGC catalog is that these two objects are the same. There is only 4884. This mystery solved I stared at the field of view for a while, and noted a ton of little “stars” that looked suspiciously fuzzy. What could those be? Since we live in the future there is an oracle in the sky that can tell us what these things are now, and all you have to do is send it a simple picture. I refer, of course, to the Astronmetry blind plate solver. I have mentioned this engine before, but at the time I did not give it enough extended credit. This system is as close to magic as we can get in the modern world. Best of all, it combines all three major dork passions into one glorious nexus of geekdom: it’s a computer that processes photographs and tells you what astronomical objects you telescope is pointing at. The exact celestial coordinates of the center of the picture. The size of the field of view. The name of every interesting object in the field. The only thing more magical would be if it ran natively on an iPad (ha ha). 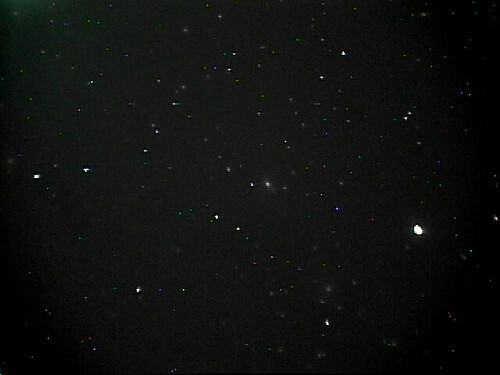 What the astrometry bot told me was that I had wandered in to a huge cluster of galactic bodies. The frame contains seventeen island universes each made up of hundreds of millions of stars. Truly a fantastic sight. It should not be possible that this looks this good. Especially since the area of the sky this sits in is in the worst of the light pollution in my yard (to the south and west). 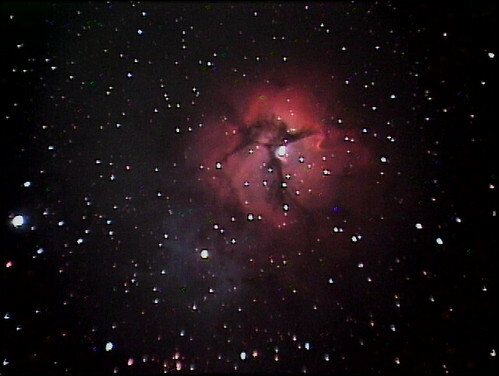 I'm looking forward to shifting from galaxy hunting to looking at the great nebulas of the summer. 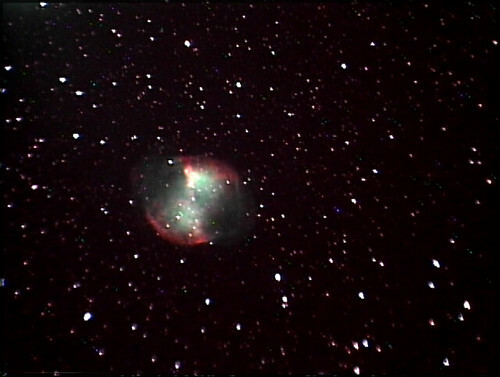 As another teaser, here is the Dumbbell (M27).